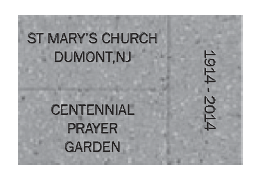 Celebrate St. Mary’s 100th anniversary, and buy a special brick for the new prayer garden. Now is your time to support the church with a onetime donation that will last a lifetime. Parishioners are invited to a buy a brick, either for you or someone else, to commemorate special occasions, or to honor or remember a special loved one. Each brick costs $50. Please drop off completed forms by Monday, May 12 in the parish office. For more information, look at the final page of the bulletin. Click here.